Center Party leader Juha Sipila also said he intends to step down on Sept. 7 after a new leader is picked. That could potentially mark an end to his political life after he abandoned a business career to lead the party to victory in 2015. He will continue to serve as caretaker prime minister until a new government is formed. The National Coalition and Greens both said on Tuesday they’re ready to partake in government talks. Orpo said any joint platform for the government must be based on a “common, realistic picture of the situation in the economy” and include responsible fiscal policies, including keeping debt growth in check. He also said the decision by Sipila to step down indicated the Center Party left the door open to joining the discussions on a possible coalition. While the Center didn’t completely rule out joining the government, it set so many red lines that reaching any compromise will be difficult. The Center Party’s announcement brings to mind its 2011 electoral defeat when it immediately decided to spend the term in opposition. 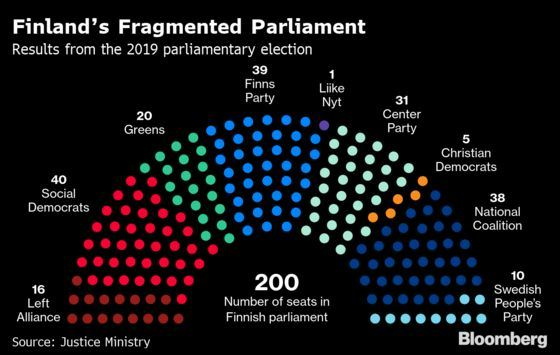 That made things harder for then-coalition builder Jyrki Katainen as other parties sought to extract large concessions. In the end, it took two months before a six-party government was formed.